Judge Brian O’Shea described Kathleen McDonagh’s actions as “smart-alec behaviour”. 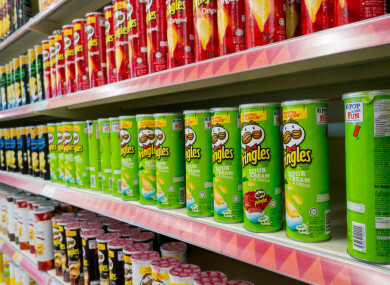 THE IRISH PENAL Reform Trust (IPRT) has criticised a court ruling after a woman, who caused criminal damage by opening a €1.50 tube of pringles at a Tesco supermarket, was sentenced to two months in prison by a judge in Cork. Kathleen McDonagh (24) from Mahon, Co. Cork pleaded guilty to causing criminal damage to the tube of Pringles crisps on 27 December 2016. Judge Brian O’Shea sentenced Mahon to four months in prison, with half of the sentence suspended, the Irish Examiner has reported. The offence took place after McDonagh – who had 14 previous theft convictions – entered a Tesco store in Mahon Point and went to the self-scan area with the packet of Pringles and proceeded to open it. Ní Chinnéide says that robust data and evidence underpinning any response to crime is what is needed. In sentencing McDonagh, Judge O’Shea said that it’s difficult not to view her actions as anything other than “smart-alec behaviour”. The judge proceeded to impose the partially suspended sentence, with recognisance pending an appeal set at €200. Email “'No social or economic sense': IPRT criticise prison sentence after woman jailed for damaging a €1.50 tube of Pringles”. Feedback on “'No social or economic sense': IPRT criticise prison sentence after woman jailed for damaging a €1.50 tube of Pringles”.